I’d like to showcase two more pedals from the lovely Dan Drive Pedals. German based builder, Daniel Querner has been turning out some really fantastic boxes of tone for the consummate guitar tone aficionado - one of which I previously showcased on a Gearheads Feature…. DAN DRIVE ::: AUSTIN BLENDER ::: OCTAVE FUZZ, BOOST & BEYOND! All of Dan’s pedals are vintage voiced circuits with modern appointments. Yet the inspiration is true and respectful while still looking forward towards creating new tones. The Secret Engine and Equilibrium both share those important qualities. The Secret Engine is Dan Drive’s answer to the Hornby Skewes Zonk Machine, a very cool and very rare fuzz pedal from the 60’s. A rough and ragged fuzz tone very similar in design to the MKI Tonebender (cue the Rolling Stone’s Satisfaction) that envelopes as you play and creates an almost octave effect at times. It’s one of those beautifully disastrous tones… a sound all guitarists eventually find themselves seeking…. “The Amp Blowing Up” tone! One way or another, at the end of the day, all we want as guitarists is to blow up our amps. Why in the world!? Well, it’s because in that last guttural rattle of death there are sounds so different and amazing than one could ever produce when the amplifier is working normal. The Zonk Machine itself came back into fashion quite fiercely from guitarist Doyle Bramhall II’s use of it all over his record “Rich Man”. It was the sound we all wanted and needed! Cut to a few years later and we have some really nice clones of these Zonk Machines available. The Secret Engine itself while based and inspired by the Zonk Machine makes some changes to better suit the modern needs of the guitar. The Secret Engine is a fat, singing fuzz tone that can yield shades of octave-up tones. Controls being: Bias, Volume and a toggle for either a Midrange or Low End boost… you really can get a myriad of tones out of the box itself. I found that my favorite settings were pretty much cranking the volume, bias to taste and running the toggle (UP) in the MID setting. This gave me a really wide and juicy lead tone. It’s the kind of sagging drive you’d think of when hearing Neil Young or Daniel Lanois run their Tweed Deluxes really hard. Perfect for any thick lead tone you might want to sit nicely in a mix. In the demo below, that’s exactly how I used the Secret Engine! The Equilibrium is essentially a hod-rod’d BC183 Fuzz Face. There’s a lot of control on this usually simple circuit… which for anyone trying to add a very finicky circuit like the Arbiter Fuzz Face can be very useful to tune each rig. The Fuzz Face itself has it’s limitations and if you’ve read any of my previous posts, I absolutely love those limitations. However, it’s still really nice to be able to fine tune when you need it. The controls available on the Equilibrium are: Volume, Fuzz, Bias and Clean-Up. You also get 2 toggles that help dial in vintage volume or the Cesar Diaz mod to get the usually low output circuit to be boosted and a low cut option. 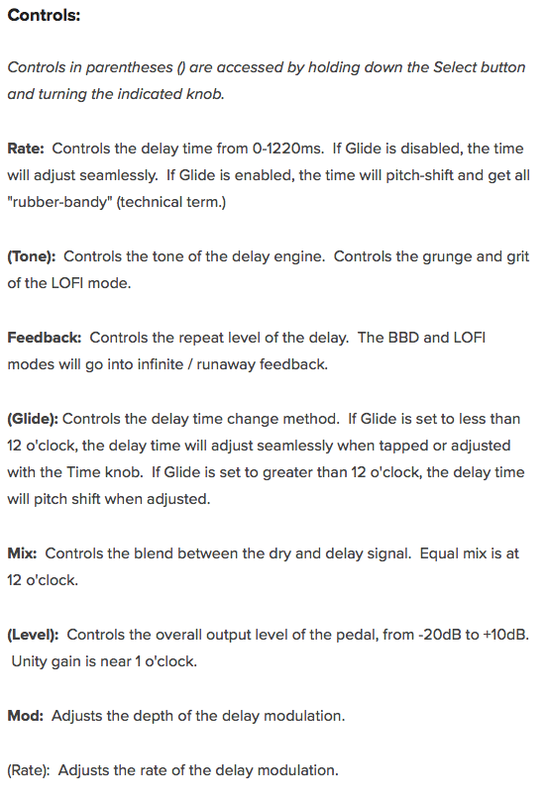 All of these options really help to fine tune the pedal in a variety of rigs and situations. I found the Clean-Up control along with the low end cut to very useful when using humbuckers. I used that setting with my Gibson ES335TD in the demo below! Both the Secret Engine and Equilibrium track wonderfully and sit perfect in a mix. You won’t have any issues being heard on stage or requiring a lot of post EQ work when recording. In the demo below you can hear the Equilibrium on all the rhythm guitars and the Secret Engine on all the lead guitars. I’m using a Gibson ES335TD with MHS humbuckers and a Danocaster S Style with Rocketfire Total 60’s single coils. Amplifiers are a Two Rock Classic Reverb Signature and Marshall Origin 20H. Reverb and Delay are coming from the UA OX Box. 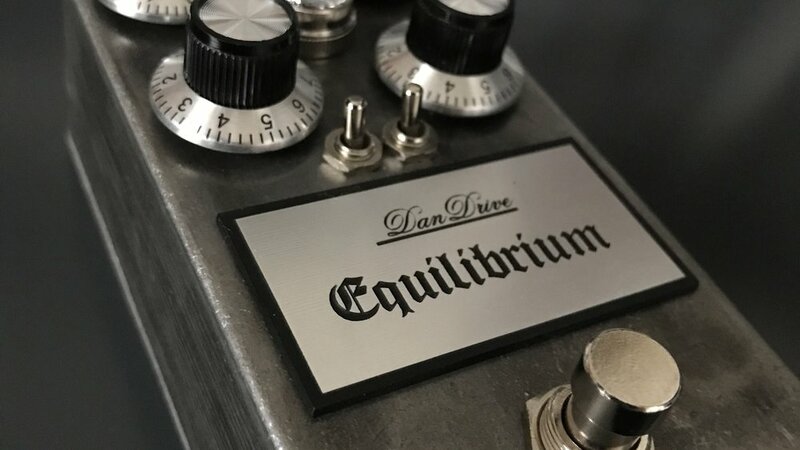 Follow these links to find out more about these pedals from Dan Drive! 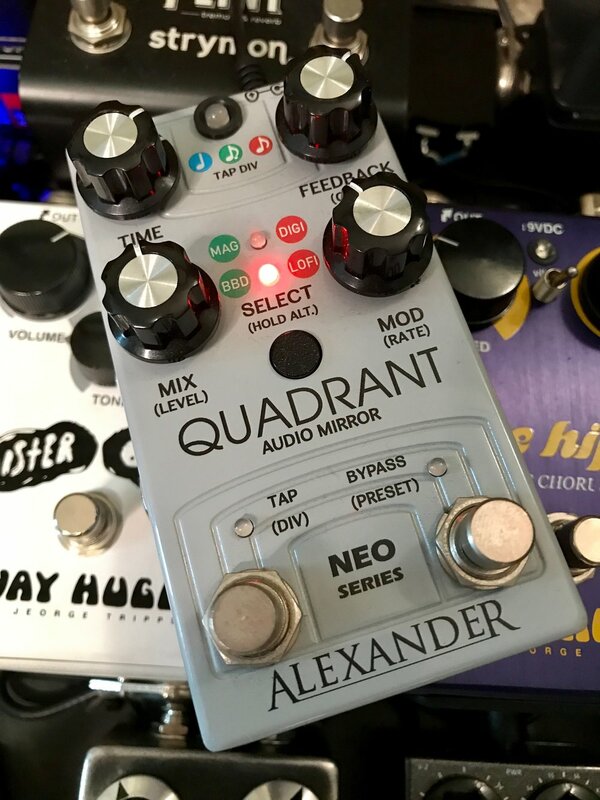 Today I’m showcasing the Alexander Pedals Quadrant Audio Mirror, a really cool and versatile delay pedal from the new “NEO SERIES” from Alexander Pedals. 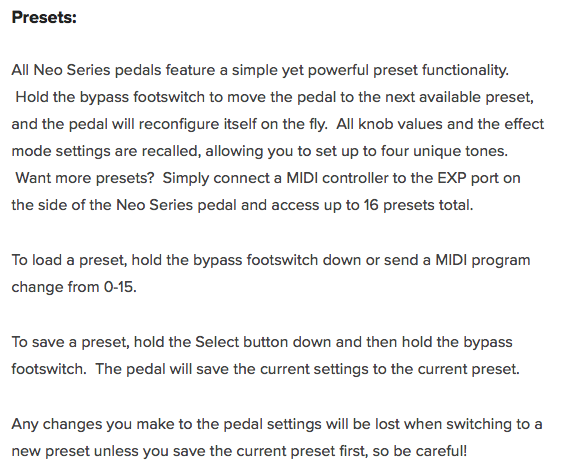 The Neo Series incorporates an advanced 32-bit microcontroller adding presets, expression, and MIDI capability. Essentially, Alexander Pedals are offering state of the art technology at much more affordable prices… and most importantly, wonderful TONES! 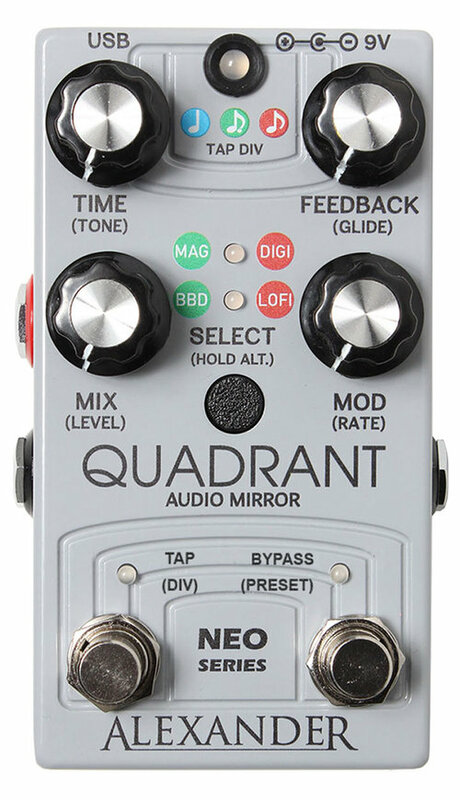 There are 4 different styles of delay available in the Quadrant: Magnetic, Analog, Digital & Lo-Fi. Each delay setting has a very natural tone that simulates it’s origin quite well. You can access these delay types either by manually selecting them or by using the available presets that are pre-loaded in the Quadrant. They give a nice idea of what this delay pedal is capable of while also giving you the option to create your own, which I highly recommend. 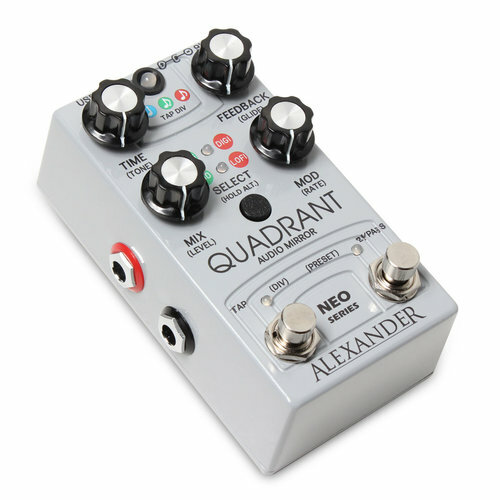 I found the tones available in the Quadrant to be very good considering it’s a digital pedal replicating the tones of benchmark delays such as a Maestro EP3 Echoplex or a Electro Harmonix Deluxe Memory Man. The sounds are very present and easy to manipulate with the simple controls. While I did test and use each delay setting for my demo, I found the Analog setting to be my personal favorite. As a lover of all things Deluxe Memory Man, I found the Analog setting to be close to that beautifully inspiring vibey and moody tone that we all love from our favorite bucket brigade boxes. The modulation circuit was on point and the tone of the Analog setting was “present” in a similar way that I find some of the best sounding big box DMM’s. In the track and demo below I focused on using the Quadrant to help create not only the tones but the music itself. It was easy and intuitive to let the music flow… at the end of the day, that alone is worth the price of admission with any piece of gear. I ask myself that question often in regards to new gear… “Does this inspire me? Does this let the creation of music flow?” It’s honestly that simple! I had a blast making this demo and urge anyone looking for a great utility delay pedal with MANY features, and most importantly a fantastic Deluxe Memory Man reproduction, to take a look at the Alexander Pedals Quadrant. MENATONE RED SNAPPER & J.A.C. COMPRESSOR MINI'S! Gearheads! Mini Gearheads! Mini-Loving Gearheads! As the great Steve Martin coined…. “Let’s Get Small” man! Unless you’ve been living under a rock large or small, you’ve most definitely seen the enormous tide of miniature pedals on the effects market. They are everywhere and found on so many pedalboards, for a very good reason… cause they’re adorable! Well no, that’s not exactly it… It’s because we as musicians have found the need for exceedingly more gear. More sounds, tones and tools than space often allows on a pedalboard. Man, if I could tell you how many times I’ve thought… “Hmmm if I could juuuuuust fit that one extra pedal on there…” It’s siren song many a guitarist have sung in the throws of a new or re-build of their systems. Cue Brian Mena from Menatone Pedals. One the O.G. 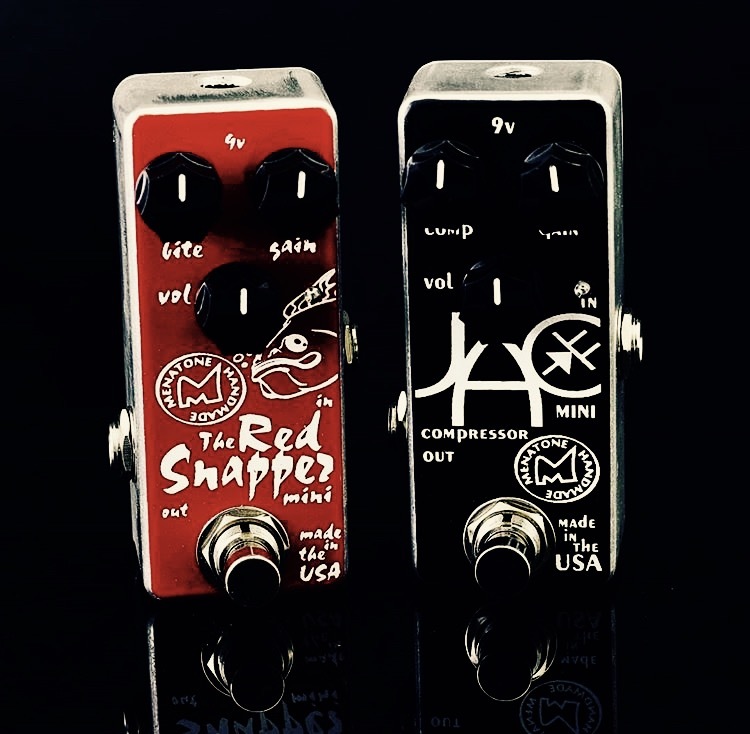 boutique effects builders who opened the door for a lot of companies, has something special to bring to the table with the new Mini Red Snapper & Mini J.A.C. Compressor. The Red Snapper is one of those quintessential overdrive circuits that’s been around since NAMM of 1998. Rich, pure, and one of those pedals that takes your hard earned tone and kicks it into the stratosphere. The Red Snapper has always held the hearts of players who yearn for transparent overdriven guitar tones, yet with the true grit and edge that an amp on the edge of breaking up can provide. It’s a fantastic circuit that’s proven it’s test of time. The J.A.C. Compressor is in my opinion a compressor for those whom don’t speak the complicated language of compression. While it’s not quite a complicated process to compress signals correctly, many guitarists often misunderstand the usage of compression and either overly compress their tones, add too much noise or hiss, or just plain chase their own dynamic tails. Compressor pedals have always added something special to guitar tones on a pedalboard and when used right, which is often the same as used subtly, the results are fantastic. The J.A.C. is an optical compressor that works like an Teletronix LA2A studio piece. The pre-amp in it is fully discrete which yields a more transparent sound, allowing the guitar’s voice and dynamics to really come though. This is why I find the J.A.C. so inviting to play. While all of this is great to hear, you might be wondering, “Well do these little pedals sound as good as the originals?” Absolutely! Menatone have chosen full size “through hole” components, and the pedals are completely handmade in the USA. To make these pedals work in such small confinements the battery space has been omitted, so you’ll need to use a power supply. I found both the Mini Red Snapper and Mini J.A.C. Compressor to work incredibly well together and on their own. In the demo track I was getting fantastic tones from using the J.A.C. to boost the Red Snapper for big and rich solo tones. The J.A.C. on it’s own shined with cleaner pushed funk tones as well as getting a fat and punchy bass track. Both pedals sounded fantastic pushing a Blankenship Fatboy, essentially 5e3 Tweed Deluxe with more output power. Rich and fat tones jumped out of the amp, tracking incredibly well giving the vintage tones a voice to be reckoned with. These pedals DO NOT sound small! The Mini Red Snapper offers some helpful EQ choices under the hood via 2 small DIP switches. Essentially giving you various different amounts of cutting the high end. When both switches are down (factory default), the Red Snapper is the same as the original 3 knob full size pedal. For my demo, I kept it set at the factory default setting as I felt I was able to get the best out of the Blankenship Fatboy and both the Les Paul and Danocaster S-Style. I could see, however, experimenting with the high cuts when using brighter or higher headroom amplifiers. Important to note: Adding in the high cut’s will allow deeper exploration of the “Bite” knob which essentially adds that “biting” upper end of the pedal’s frequency. The Mini J.A.C. Compressor is as simple as it gets, with no internal switches and with 3 simple controls (Comp, Gain & Volume). I find that the interaction between the 3 controls are very intuitive and dead simple. This is MY kind of compressor pedal! I can see adding the J.A.C. to any rig where you might need a transparent and juicy compressor or even a rich and fat clean boost. Add in it’s small stature and industry standard 9v power requirements and you’ve got a winner! 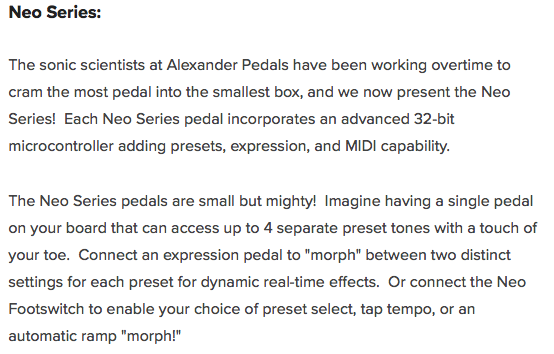 As the world turns, more mini pedals seem to pop up in the already saturated pedal market. While many manufactures forsake tone and substance to shrink their wares, Menatone are taking this new small world seriously & sacrificing nothing. Using full size components that are hand built in the same way they’ve always been making them, there is truly no reason to pass on a chance to squeeze one of these killer pedals into the available space on your board… There is always room for one more! As many of you know, I’m a certifiable Fuzz junky. I have spent many years obsessing over the most minute details of circuits available in the modern effect market that can shed a light on the sounds and tones of the past. To put it as easily and plainly as possible, I LOVE Fuzz, most notably, the Fuzz Face. 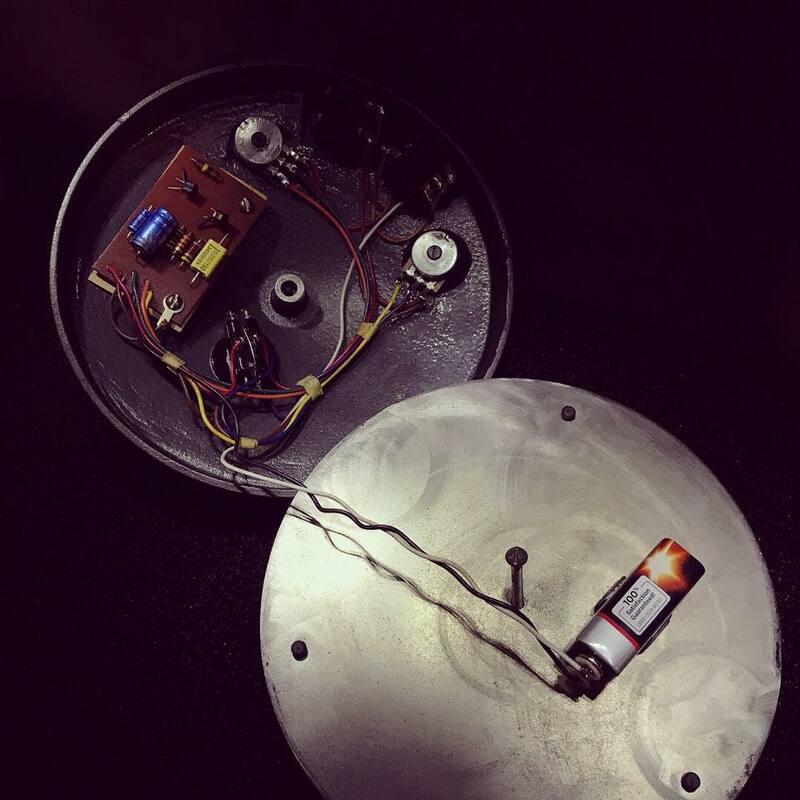 With it’s simple circular, flying saucer enclosure to it’s constant smiley face — the Fuzz Face is without a doubt a true master tool in the world of guitar effects. It’s constant ability to let the player dictate the subtle to blasting shades of gain and color, match perfectly within it’s simple controls and circuit deep inside it’s shell. Cut to Mr. Dustin Francis and his beautiful creations: the Ivor Fuzzes. I happened upon the insane fuzzes that Francis painstakingly makes via my tonal guru in arms and good friend David Phillips at LA Sound Design. Knowing that I have a deep affinity for great and unique pedals, David hipped me to these killer pieces. 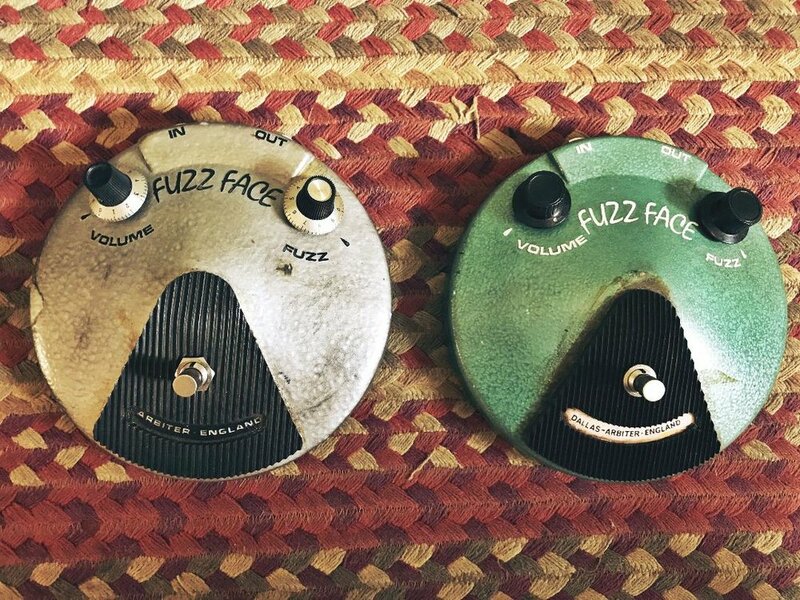 Essentially, the Ivor Fuzz Faces are replicas, recreations made to the specific year they were created in history…. in real life. You’ll find a 1966, 1967, 1968, 1969 and 1970. Each year corresponds to the type of transistor and parts used, even down to the smallest detail of the look of the enclosure to the knobs and switches. The Ivor is no replica… it’s a freaking time machine! Francis spends an incredible amount of effort, time and love crafting the look of these fuzzes so that they look and feel like the real deal. Some are more relic’d than others just as you’d experience them in real life. The artistry is completely evident in the cosmetic and the functional. The circuits are tuned so perfectly that they are essentially the very best examples of what a vintage Dallas Arbiter Fuzz Face should sound like. This, my friends, is what sets these fuzzes aside from a lot of clones and recreations on the market… the feel, vibe and tone is all there. Try finding a vintage 1969 Arbiter Fuzz Face used on today’s market and after spending at least $1500 finding it sounds like a fart in the wind! 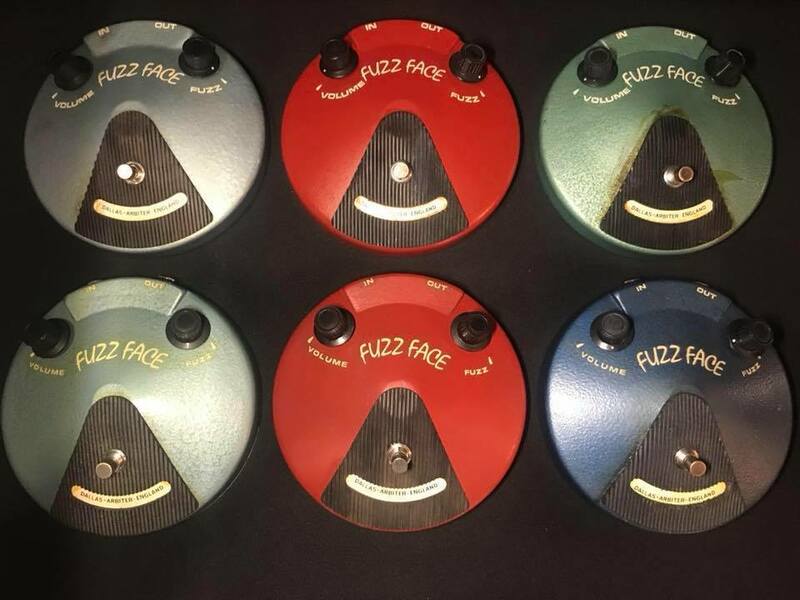 That’s the joy in what Francis is doing with these fuzzes… giving the player the best of the best with the experience, eye and artistry of what makes Ivor fuzzes so good. I personally own two Ivors, a 67’ and a 69’. The 67’ is a NKT Germanium fuzz that is the most temperature stable Ge fuzz I’ve ever come across. It’s got that beautiful rich early Hendrix gain complexity, perfect midrange content and fantastic “clean-up”. Francis mentioned many of his favorite tones from great Fuzz Faces are the “Clean-Up” tones and how rich and organic they can sound… not at all thin, shrill or bright. The Ivor Fuzzes are exactly that. My 69’ sports Silicon BC108c transistors and the fuzz is voiced very much, or rather exactly like, one of the fuzzes guitarist Eric Johnson once owned and loved, specifically the one used on his project “Alien Love Child”. This is the perfect live fuzz for me. Big and bold, rich yet cutting. With Silicon transistors always being temperature stable I can take her anywhere and always get the same tone. The “clean-up” is fantastic and really shines in a band mix on stage. These fuzzes are like friends really. They both do their own thing really well, have wonderful attributes that help usher in inspiration and joy when making music. That’s what this is all about, right!? Making music! Of course we, I and ALL of us guitarists can get lost within a world of superlatives and hyperbole but when you strip away everything, what’s left? The need for tools that help us create and make art. Things that inspire us to jump into the unknown. The Ivor Fuzzes embody exactly that. They are totems of inspiration… helping us step into the past, present and ultimately the future. From my perspective, that future is looking bright, full of smiles and wonderful music to be made! Check out Ivor by Dustin Francis for more information. Hello Gearheads! Today I have an incredibly cool trio of pedals from the amazing Austin, TX based Shin-Ei Products, makers of the venerable Vibe Bro (one of the closest recreations of the original Uni-Vibe). Shin-Ei, led by Bob Feldman, are setting out to not only bring back the company's namesake from the grasp of history and time, but also to recreate some of the coolest and killer sounding effects that made the original Japanese company what it was. The pedals sound amazing, look amazing and feel amazing. The amount of attention to detail is off the charts with everything Bob and crew are coming out with. Down to period correct labels, every aspect of the original design is there... and more. While I am focusing on Shin-Ei's newest release, the Screaming Sister 8ctave Boost, I am also going to showcase the Vibe Bro and B1G 1 Gain Booster. All the pedals work so well together, it's truly evident that major craftsmanship is at play here. These are, first and foremost, handmade, hand-wired and artfully created tools for making music. The Screaming Sister 8ctave Boost is a tribute to the vintage octave boost pedal used by many iconic guitarists including Doyle Bramhall II, Johnny Lang and Kenny Wayne Shepherd. While it's slightly different than the standard Octavia style octave fuzz, those types of tones are absolutely available. The ability to mix in the clean signal with the octave fuzz is key for a vintage fuzzed out tone, heard often by players mentioned above. Simply put, the Screaming Sister sounds KILLER... like, really good. It's got a very vintage leaning, with a germanium transistor type tone that sits in between soulful and sinister. It's the kind of pedal you step on for a solo and heads turn... there's a reason these tones are sought after. While the tone is always the most important aspect for any kind of gear, this pedal also looks amazing. It's enclosure is a nicely weighted cold rolled steel that's powder coated and will stand the rigors of any road you choose to travel. Shin-Ei are also using a new silent "Demont" footswitch that is not only the highest caliber but also is really cool for quiet moments where you don't want an audible click when turning on the pedal. A nice touch that really adds to the feel and vibe of the pedal. The Vibe Bro of course is the flagship pedal and first offering from the newly rebranded Shin-Ei. The King of Uni-Vibe pedals in my opinion, from the incredible enclosure to the tone and feel of the pedal. I've owned a lot of Uni-Vibe clones (more than a bunch, to be honest) and over the years I've always kept a hefty search open for the best sounding and feeling Uni-Vibe available. The Vibe Bro is just one of those pieces of gear that once you get into it, you realize that it's all there. It's quite literally the closest sounding version of the photocell modulating chorus made famous by Jimi Hendrix, David Gilmour and Robin Trower. Jimi was obsessed with the tone of being underwater and undulating chorusing... so am I. It only makes perfect sense that the apple of my "vibe-eye" should come from a company setting out to recreate the original in the name and tone. The Vibe Bro is truly a vibe connoisseur's Best In Show, in my opinion. Just try to not feel something wonderful while the waves flow over you as you play... I dare you! Lastly, I decided to showcase Shin-Ei's B1G 1 Gain Booster as I had a chance to get to know it a few months ago during a "Quick-Look" Demo on the pedal. A fantastic clean boost and EQ sweetener designed by electronics guru Lee Jackson, the B1G 1 is a serious piece of kit. Take a look at that Gearheads post here: Shin-Ei B1G 1 Quick-Look Demo. It's one of those incredible pedals that's decidedly simple yet so effective, and sounds so good! Well, that's enough talking shop for now... Onto to the music! Check out the video demo below and as always, please LIKE, COMMENT & SUBSCRIBE for more of the best gear reviews and content around! Hello Gearheads! Today I'd like to share my demo of the very cool CHASETONE '68 Red Velvet Fuzz. A hybrid fuzz capable of scratching the Dallas Arbiter itch and then some! At it's heart are a pair of BC183C Silicon Transistors that yield a wide variety of tones. Kyle Chase set out to recreate the tones and feel of his favorite 1968 BC183 Dallas Arbiter Fuzz Face and go beyond the circuit board to push the boundaries of what his pedal could do. What you get is essentially an extremely versatile Silicon Fuzz that sounds great at an extremely affordable price point. I was able to coax very convincing Germanium tones out of the '68 Red Velvet Fuzz and did not find the need to run any additional pedals after it. It's warm and full, yet still absolutely has a cutting brightness assuring that you'll never get lost in the mix. With a nice feature set, you're able to control quite a bit of the tone of the pedal. Between the MIDS, FEEL & BASS controls, you can tailor the fuzz to pretty much any guitar or amplifier. I also found the "Clean-Up" of the pedal to be quite good, as good as many Germanium Fuzzes I've owned. I first came across Kyle Chase's work via his Secret Preamp, an extremely useful piece of equipment, essentially a perfected Maestro EP3 Echoplex's Preamp section. I was blown away by how great it made my rig sound and I'm happy to say that I'm equally impressed by the '68 Red Velvet Fuzz. It's a dynamic, easy to use and great sounding fuzz at a price point that doesn't reflect the tones coming out of the speaker... a win for any tone hunting Gearhead! Happy Friday Gearheads! Today I'd like to introduce my first video demo in my "Quick-Look" series - focusing on a less produced and more immediate take on a particular piece of gear. Today, I'm happy to share the Shin-Ei BIG 1 Booster - an incredible high headroom, studio quality pre-amp and boost. From a company that has re-birthed the venerable name of Shin-Ei and created quite possibly the best sounding and feeling Uni-Vibe (Vibe Bro) replication on the market, it's no surprise the BIG 1 Booster is a winner. I had the pleasure of checking one out for a few sessions I was doing here in town and shot some quick impressions before sending it back. While the BIG 1 is intended to be used at the end of an effects chain, I found it very useful in front of my pedalboard as a tone sweetener and boost for gain pedals. Essentially, the BIG 1 can be used in different locations and formats. It's extremely high headroom bandwidth offers up a bevy of tonal options. I particularly loved how the BIG 1 added punch, clarity and girth without losing any of the original tone. You can really hear the natural tone of the instrument and effects when using the BIG 1. Enjoy the "Quick-Look" Demo below and remember to SUBSCRIBE to Tinkercity Music for more videos and explorations into the best gear around. Berkos FX Third Stone II Fuzz NEW Demo! Hello Gearheads! I'm pleased to bring you my newest video demo on the venerable and personal favorite: Berkos FX Third Stone II Fuzz! For any of you who might know me or have followed my journey through the vast abyss of Fuzz pedals I've tried, owned, and experienced, the Third Stone II has stayed strong and true. It sits really well in a mix, sounds huge when you need it to, and works with every musical context I throw at it. I wrote a Gearheads blog post on the Third Stone II back in April which can be seen HERE, and am happy to add a full new video demo that shows how I specifically use the fuzz. The Third Stone II was used on all the guitar parts in the demo: Different settings on the pedal itself and on each guitar's volume knob, to attain different gain variations. There are a TON of tones in this pedal and even though it's sonic structure is a strong one, there's quite a bit of uniqueness to each layer in the track --- the ultimate compliment in my opinion! Without further ado, enjoy the demo below! Please like, comment and subscribe to the Tinkercity YouTube channel below for more videos of killer gear! Until next time! Happy Tone Hunting!